Easton Pennsylvania has two main courthouses. The Northampton County Court of Common Pleas is located at 669 Washington St, Easton, PA 18042. Additionally, the U.S. District Court of the Eastern District of Pennsylvania is located at 101 Larry Holmes Drive #400, Easton, PA 18042. An Easton personal injury lawsuit can be brought in either location depending on the facts and circumstances surrounding the Easton PA personal injury accident. Our Easton personal injury lawyers are prepared to bring a personal injury lawsuit in the Northampton County Court of Common Pleas of the U.S. District Court of the Eastern District of Pennsylvania. Easton highways and roadways have seen an increase in Easton car accidents over the past few years. Highways like the Route 22, Interstate 78 and Route 33 are seeing a record high in automobile travel and tractor-trailer semi truck accidents. Furthermore, inclement Easton PA weather has caused numerous Easton car accidents on I-78 and Route 33. Busy streets like Route 611, Northampton Street, Route 248, Washington Street, 3rd Street and Cattell Street have seen more traffic congestion in recent years and more Easton car accidents due to inclement Easton Pennsylvania weather. Our Easton personal injury attorneys work with the highly regarded car accident reconstructionists to unsure to best results for our Easton PA clients. Our personal injury attorneys in Easton PA will meet you and your family at any of the local Easton hospitals, if that is more convenient. We travel to Easton Hospital located at 250 S 21st St, Easton, PA 18042 and St. Luke’s Hospital Anderson Campus located at 1872 St. Luke’s Blvd, Easton, PA 18045. Our relationships with both hospitals near Easton PA are an asset for collecting crucial medical records for every Easton personal injury lawsuit as well as fatal medical malpractice lawsuits in the Easton area. We are happy to reserve a conference room at any of the aforementioned Easton hospitals. If you need an Easton lawyer near me, we are happy to meet you at your residence, apartment or home. Call a personal injury attorney Easton PA today for a free consultation. Our Easton personal injury law firm works with the best private investigators and accident reconstructionists in order to put the pieces together after an Easton PA personal injury accident. These investigators and experts have excellent relationships with the Easton Police Department located at 48 N 4th St, Easton, PA 18042 and the Pennsylvania State Police Troop M located at 654 Bangor Road, Nazareth PA 18064. After an Easton personal injury car accident it is crucial that a law firm’s investigation work hand-in-hand with the local Easton Police Department and Pennsylvania State Police to properly determine all responsible parties and preserve all evidence as quickly as possible. The Trapani Law Firm is proud to offer legal internships with all of the local Lehigh Valley colleges and universities. Our law firm accepts applications from Lafayette College located at 730 High Street, Easton, PA 18042, Penn State Lehigh Valley at 2809 Saucon Valley Rd, Center Valley PA 18034 and Northampton County Area Community College at 3835 Green Pond Rd, Bethlehem, PA 18020. The Easton personal injury lawyers at the Trapani Law Firm spend much of our time litigating personal injury lawsuits. All of the aforementioned local experiences and Easton activities are an established asset when it comes time to pick a Northampton County personal injury jury. 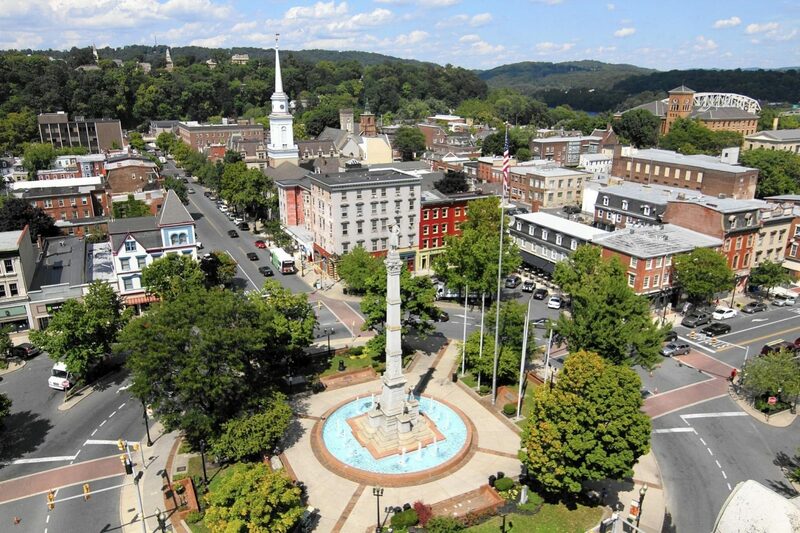 There is not an Easton Pennsylvania zip code that our lawyers are not familiar with. Moreover, our trial preparation cannot be outmatched and we will not be outworked. Call us anytime for a free Easton personal injury consultation. The city of Easton PA and the greater Lehigh Valley have excellent public transportation options. The most common is the LANTA Bus also known as The Lehigh and Northampton Transportation Authority located at 3610 Nicholas Street Easton, PA 18042. A great options for travel into Easton PA is the Easton Intermodal Transportation Center at 123 S 3rd St, Easton PA 18042. Here you can jump on a Greyhound bus. The Trapani Law Firm represents individuals who have been injured in an Easton bus accident. Many Easton PA residents prefer to drive and can get properly licensed at the Pennsylvania Department of Transportation Center or Easton PennDOT, located at 2473 Nazareth Rd, Easton, PA 18045. If you own a car in Easton, please be sure to elect full tort auto insurance coverage so that you are full protected in the case of an Easton car accident. Additionally, Easton taxi services and Uber are two great ways to get around the Easton area. Our Easton personal injury lawyers are here to protect the local community should any Easton bus or car accidents take place. Call us anytime for a free consultation. Our personal injury attorneys in Easton PA are extremely familiar with the city of Easton, which is crucial when picking a Northampton County jury for a personal injury trial. We make sure our team spends time in the city so that we have a familiarity with the community. On the weekends, our lawyers will visit the local Easton PA events like the Easton Farmers Market at Centre Square, Easton, PA 18042, the Easton Public Market at 325 Northampton St, Easton, PA 18042 and the Easton Bakery at 34 N 7th St, Easton, PA 18042. We read the Easton Express to get our Easton PA news and spend time at the Easton Public Library at 515 Church St, Easton, PA 18042. We eat at the local Easton PA restaurants in the Easton Circle and use the Easton Post Office located at 201 Ferry St, Easton, PA 18042. Additionally, attorney Trapani attended the Easton Area School District and graduated from the Easton Area High School located at 2601 William Penn Highway, Easton, PA 18045. There is not an Easton PA zip code that our injury law firm is not familiar with and when it comes time to pick a Northampton County personal injury jury, we will be prepared. Easton Injury Law Firm - City Information	Overall rating:	5	out of 5 based on 10	reviews.